Can You Stain Ceramic Tile? 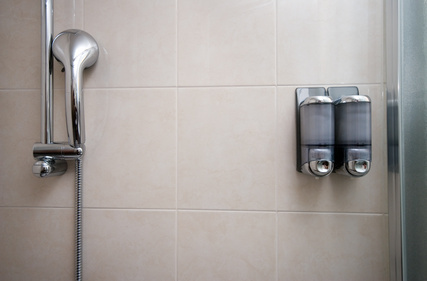 Shower tiles may become damaged or cracked over time from constant heating and cooling, as well as dropped items. Depending on the level of ambient stress placed on the tile by the cement during installation, occasionally just a slight bump will cause a tile to crack. Instead of paying hundreds of dollars for a house call from a bathroom contractor, consider doing it yourself for less than $20. Inspect the shower to determine how many broken or cracked tiles you wish to replace. Using a piece of a broken tile, locate a suitable replacement(s) at a local hardware store. Be sure to purchase enough to complete the job, plus a few extras for any future repairs. Apply masking tape around the tiles to be removed, so that other tiles are not damaged or scratched in the repair process. Using a grout saw, remove all grout lines surrounding the tiles to be removed. Instructions on proper use of the grout saw are usually on the back of the saw packaging. Use firm, even strokes, and be sure to remove all the grout, down to the cement beneath it. Put on eye protection. Pry out the tiles to be replaced, using the edge of a chisel for leverage. If it won't budge, gently tap beneath the tile at a 45-degree angle with a hammer and chisel. Be careful to only use as much force as is necessary to remove the tile. Make sure your eye protection is in place whenever you attempt to remove old tiles; flying pieces of broken tile are extremely sharp. Chisel out any remaining dried cement beneath the removed tile. The dried cement will look like a series of cement ridges and troughs. Carefully apply light taps with the hammer and chisel to remove these ridges, so that the area is completely smooth and flat. Wipe the area clean with a damp rag to remove any remaining dust. Place the replacement tile in position, and check that it fits snugly in the allocated space. If so, apply a small amount of tile cement to the back of the tile with the toothed trowel. Be sure to hold the trowel at a 45-degree angle to the tile when applying cement, so that the peaks and troughs in the cement are the proper dimensions. Precise instructions on how best to apply cement with a toothed trowel are located on the reverse of the tile cement packaging. Apply firm, even pressure to set the tile in place once the cement has been applied. Try to set the tile so it is flush and even with the other tiles surrounding it. Look closely before assuming it is in place correctly. Let the replacement tile dry for 24 hours before grouting the lines surrounding the tile. Remove the masking tape. Apply grout to all areas surrounding the replacement tile, following the manufacturer's grout application procedures. Make sure you apply the grout with firm pressure, and apply it from all directions to fully penetrate the open grout line spaces. Let the grout dry for at least 24 hours before using the shower. Practice applying the tile cement several times to a spare tile to be sure that you spread the cement evenly. When applying fresh grout, try to match the existing color as best you can.